Mix the above in a non-reactive bowl, cover with plastic wrap and marinate in the refrigerator overnight. 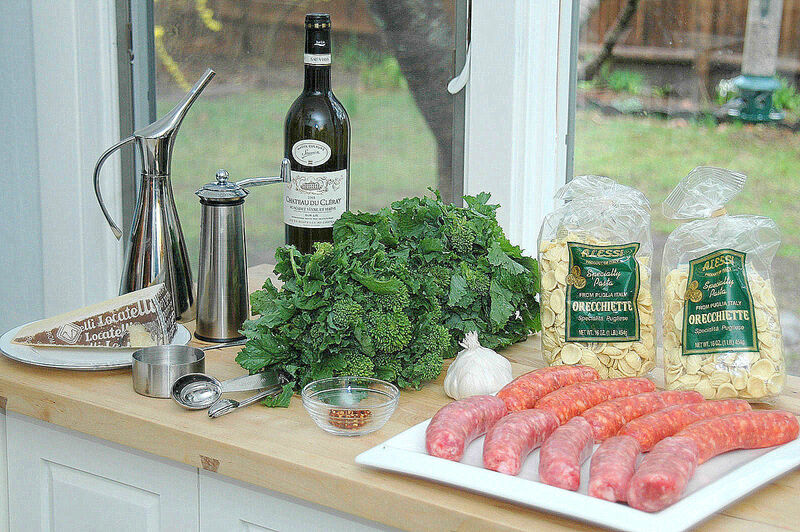 When ready to make the Ragu, discard the rosemary, garlic and bay leaves. Drain the meat in a strainer over a bowl, and reserve the marinade. In a heavy casserole pot, heat the olive oil on medium. Add onions, carrots and celery and lightly sauté for about 5 minutes, remove and set aside. In two or more batches, add the Wild Boar Meat, brown on all sides turning frequently for about 15 minutes, until all liquid is absorbed. Add back the vegetables from step 2. Add the marinade and bring to a boil. Add the tomatoes, bay leaves, garlic, red pepper flakes, anchovy paste and chopped herbs. Remove bay leaves and discard. At this point the ragu is done and can be used immediately or frozen in small batches and used later. There should be enough for 6 meals, or a meal for 2 on 3 separate occasions. Serve with chopped basil and grated Pecorino Romano, preferably Locatelli brand. Linguine with Cauliflower Sauce was a staple meal when I was growing up, so David Tanis’ recipe for Rigatoni & Cauliflower al Forno (i.e., baked in the oven) resonated with me. But being addicted to big, bold flavors, I thought that the amount of spice in his published recipe would be lacking to my palate. So, I doubled, tripled and even quadrupled his quantities. As a matter of fact, I believe that the only quantities I did not adjust were the those of rigatoni and cauliflower. However, I did use his recommended cooking times. If you think that the amount of capers, garlic, crushed hot pepper, sage and cheese that I used might be daunting to your palate, by all means use his original recipe at NYTIMES.com. Either way I hope you will enjoy this dish. 1. Heat oven to 400 degrees. 2. Bring 6 or 7 quarts of water to boil. When the water begins to boil, add about 1 teaspoon of kosher salt and the rigatoni. Stir well and cook for two minutes fewer than the directions on the box or package, as the macaroni will continue to cook in the oven. Drain the rigatoni, rinse with cold water, and set aside. 3. While the pasta water is boiling, trim all leaves from the cauliflower, cut it in half lengthwise, and remove the tough core. Cut the halves crosswise into ¼ inch slices. 4. In a large sauté pan, heat 3 tablespoons of the olive oil on high heat. 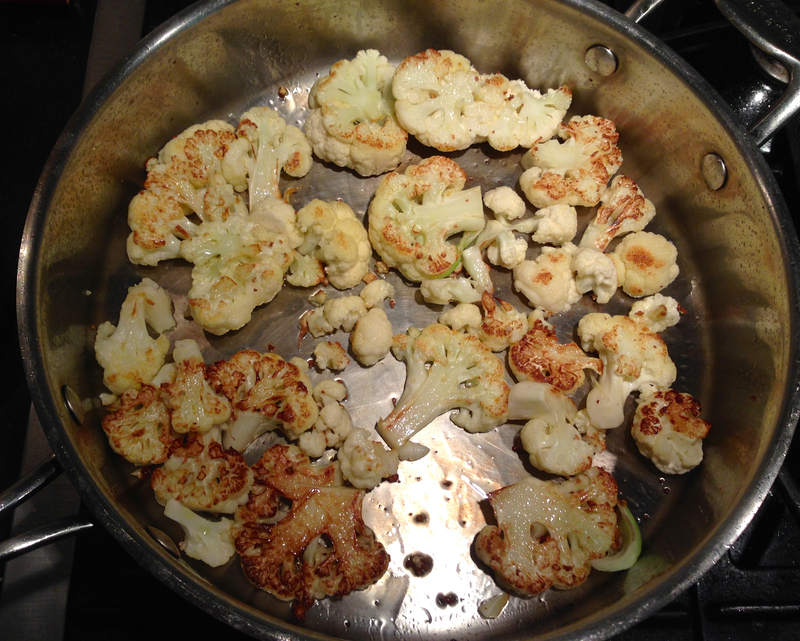 Add the cauliflower without crowding, cook in batches with added olive oil if necessary. Brown the cauliflower until caramelized on both sides. After the last batch of cauliflower is cooked, add back the previous batches, add the capers, garlic, hot pepper, sage and lemon zest, stir well. Add salt and pepper to taste. Stir well again. 5. Remove the cauliflower mixture to a large bowl, add the set-aside rigatoni and mix well. Add the grated mozzarella and mix well again. 6. Coat the bottom and sides of a large (18” x 12”) stainless steel roasting pan with a film of olive oil, add the mixture, spreading it evenly over the pan. Sprinkle the Pecorino-Romano cheese and bread crumbs over all, then drizzle the 1/3 cup of olive oil over all, as well. 7. Place pan on top shelf of oven and bake uncovered at 400 degrees for 20 minutes until the top is crisp and golden. Sprinkle with parsley before serving. 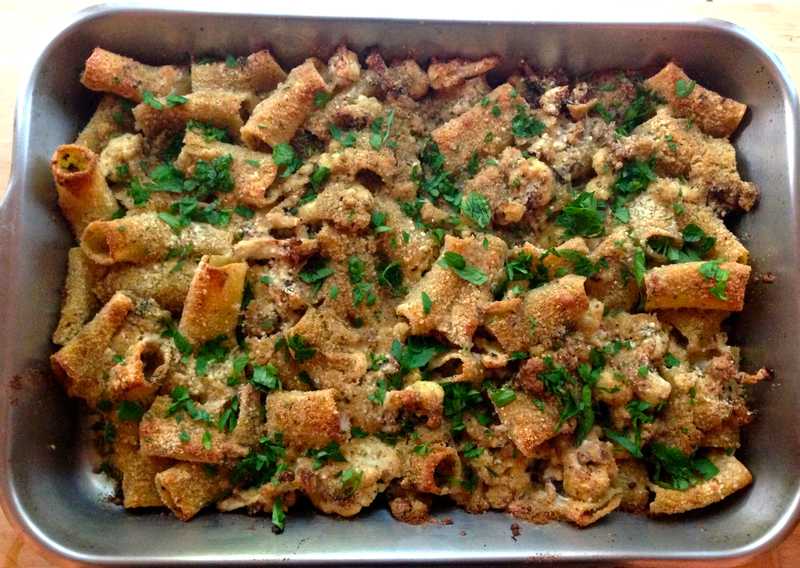 We served this with a chilled bottle of delicious Arneis. The sauce for this pasta dish originated in the town of Amatrice, which is in the Lazio Region of Italy, northeast of Rome. Many recipes call for the use of guanciale, which is not always readily available, so if I am unable to get it, I use pancetta, which is perfectly acceptable. One could also use prosciutto, as well. However, if you can obtain guanciale, I would recommend trying it, as it has a slightly different pork flavor and texture. The classic pasta shape used with an Amatriciana sauce is bucatini; however, because of its thickness, it can be somewhat difficult to wrap around your fork. I find that rigatoni works well as the sauce and the pancetta work their way into the pasta tube, giving you more flavor in each mouthful. But, once again try the bucatini yourself for a different eating experience. 1 lb. pancetta, diced, or cut into matchsticks of 1/4 inch. Heat the olive oil in a skillet on medium high. Add the garlic and stir well for about 30 seconds, add the pancetta and lower heat to medium. Cook pancetta, stirring regularly, for about 4 minutes. Raise heat to high and continue stirring until the fat is rendered and pancetta is just before getting crisp, about 2 minutes more. Remove pancetta with a slotted spoon and set aside. Pour off the fat except for about 1/4 cup. Add the onion and cook until soft, stirring to scrap up the fond. Add the wine and deglaze the pan. Add the rigatoni to the boiling water and cook for one minute less than al dente. Crush the tomatoes and add to the skillet. Add back the pancetta. Cook on medium for about 8 to 10 minutes. Drain the rigatoni and add to the sauce, mix well for about 30 seconds. We recommend a good Italian red wine to accompany thus dish. One of our favorites is a Barbera D’Asti Superiore from the Piemonte region of Italy. 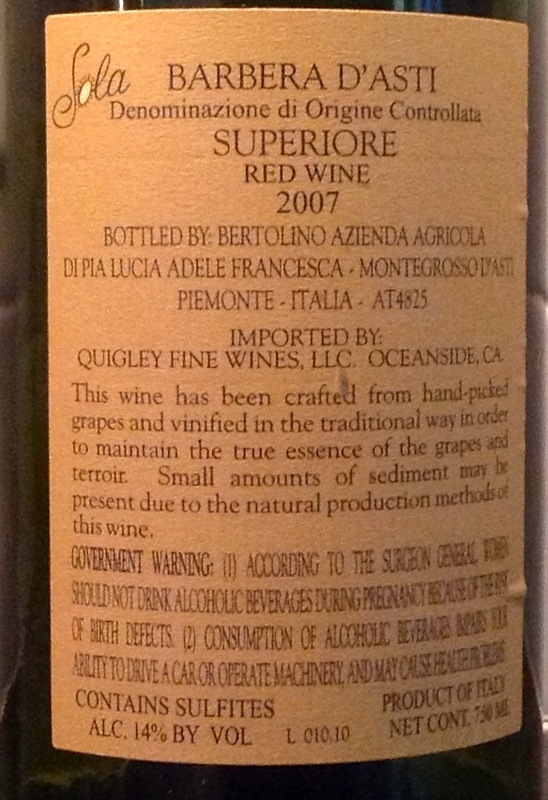 Quigley Fine Wines imports an excellent one called Sola. It is produced by Agricola Bertolino. A few nights ago, Betty made a big platter of her famous Paella Isabella. It served 5 for dinner very nicely. However, not all of the clams and chorizo that we had bought wound up in the paella, which got me thinking about what to do with them the next day. Having a vague recollection of a pasta dish with clams and pancetta, and thinking about dishes where seafood and pork combine nicely, I decided to experiment with these leftovers. 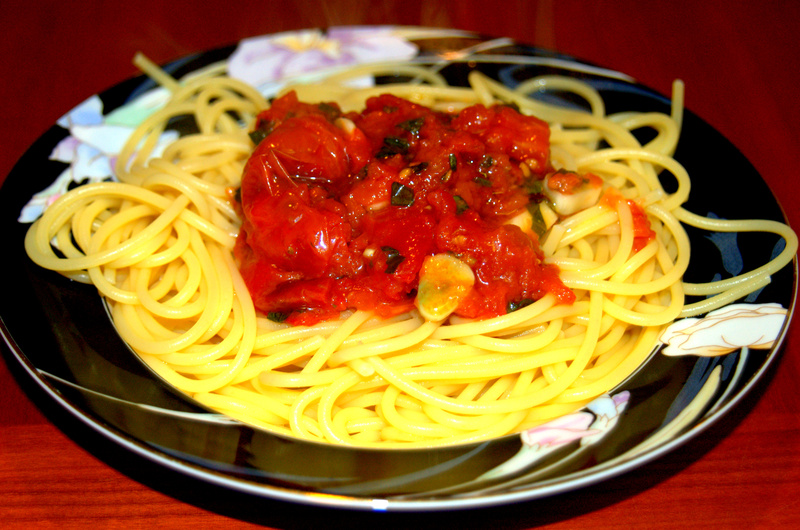 A light tomato sauce, almost a Marechiaro, seemed to be the right approach. Rather than parsley, Betty suggested a little cilantro to finish the dish. It was the right thing to do, and the result was sublime. 1. Boil a large pot of water for the spaghetti. 2. Heat olive oil in a separate pot, about 5 qt. sized. 3. Add the garlic to the oil, and sauté lightly; do not let it burn. 4. Add the wine and bring to a boil. 5. Add the clams and cover the pot. 6. After about 2 or 3 minutes, add the tomatoes and chorizo. 7. 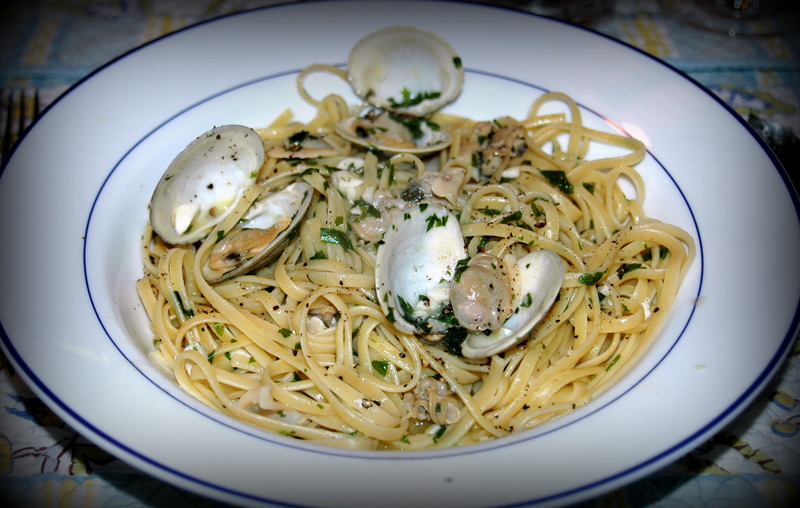 When clams begin to steam open, add the spaghetti to the boiling water and cook according to directions. 8. 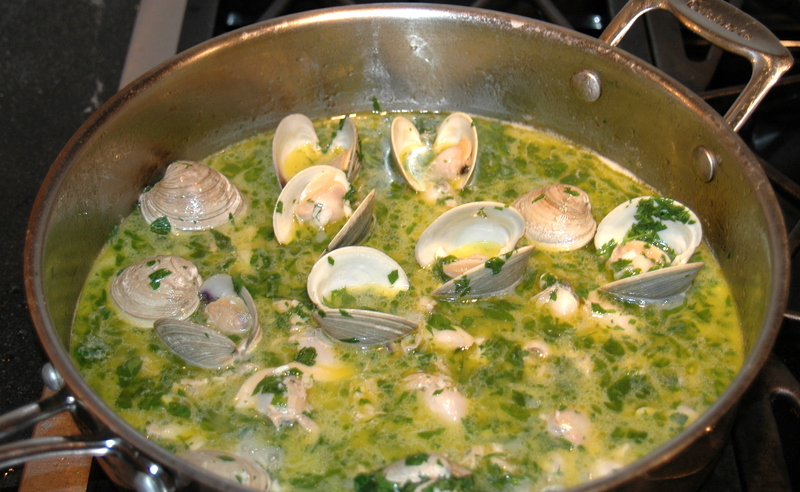 Once most of the clams have opened, to avoid over-cooking them, remove them to a bowl while the sauce continues to boil and thicken, and until the spaghetti is done. 9. When the spaghetti is al dente to the taste, drain it and add it to the sauce. 10. 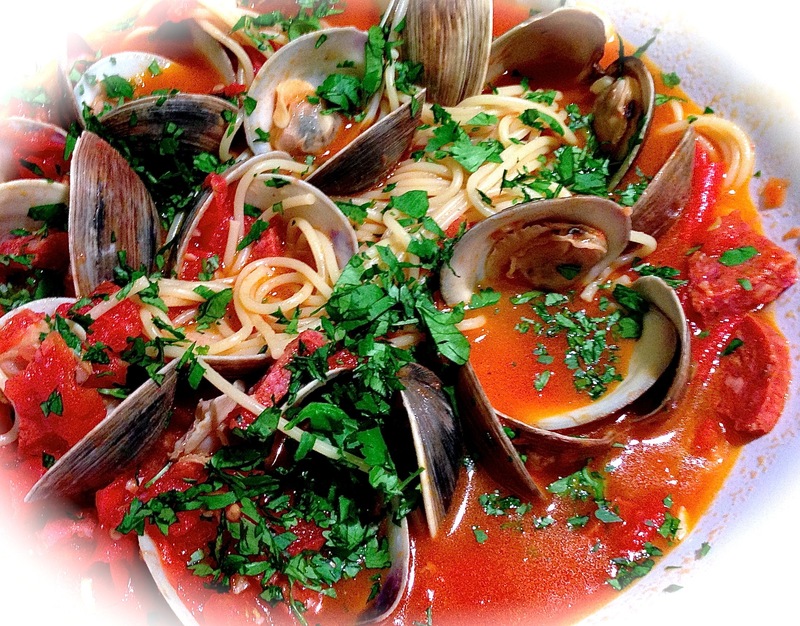 Transfer the spaghetti and sauce to a large serving bowl, add the clams and garnish with cilantro. 12. Feel free to add grated pecorino-romano cheese, if so desired. Preparation time 30 minutes plus 30 minutes marinating – serves 2, no leftovers! A few weeks ago, the Travel Section of the Sunday’s New York Times, contained a wonderful article by Russell Shorto (Sciotto), on discovering his Sicilian roots. In it he mentioned having a dish of macaroni, swordfish and mint in a Sicilian restaurant. Intrigued by this combination of ingredients and remembering a dish of Pasta con Sarde that I once had in a now defunct New York City Sicilian restaurant, I decided to try and make Linguine with Swordfish. My interest was also piqued, as fresh Harpooned Swordfish is readily available from our local fishmonger. I thought long and hard about how to go about this and ultimately decided to marinate the fish then pan grill it, de-glaze the pan with wine, toss in some tomatoes and capers, the latter for their saltiness, some fish stock or clam juice for liquid, and instead of mint, chopped parsley. It was easy to make and delicious. Next time I think I will try the mint. In a non-reactive dish, remove the skin and marinate the Swordfish in Olive Oil, Lemon Juice, Salt and Pepper for 30 minutes, turn once. Set a pot of water to boil for the linguine. Pre-heat a cast iron skillet, add the Swordfish and grill it on high heat for 5 minutes on each side, slowly add the marinade to the skillet throughout the grilling. Remove the fish, set aside and keep warm. Deglaze the skillet with white wine. Add tomatoes and capers. Cook on high for 8 mins or so, stirring regularly until the tomatoes begin to break down and the sauce thickens. Cook the linguine according to directions on the box, usually 8 or 9 minutes for al dente. Add the Clam Juice and when it comes to a boil, reduce heat to medium low. In the meantime, cut swordfish fish into 1 inch cubes, return the fish to the sauce to and heat thoroughly. When the linguine is done, strain it in a colander, transfer it to a large bowl, add the sauce and mix well. Add the parsley and toss well again. Serve with grated Locatelli-Romano cheese if that is your preference. Do not be cowed by those who dictate that it is anathema to add cheese to pasta with seafood. 1 &1/2 tbsps. garlic, minced. About 4 good sized cloves. 2. In the meantime heat the oil in in a large sauté pan, add garlic and jalapeño and cook briefly until garlic is translucent, add the tomatoes and bring to a boil. 3. Melt butter in a 3 qt. pot with a cover. When melted, add cognac and bring to a boil. Add the Shrimp Bouillon cube and stir well. 4. When the cube has disintegrated, add the mussels, cover and steam until all are opened, about 4 to 5 minutes. Do not overcook. 5. 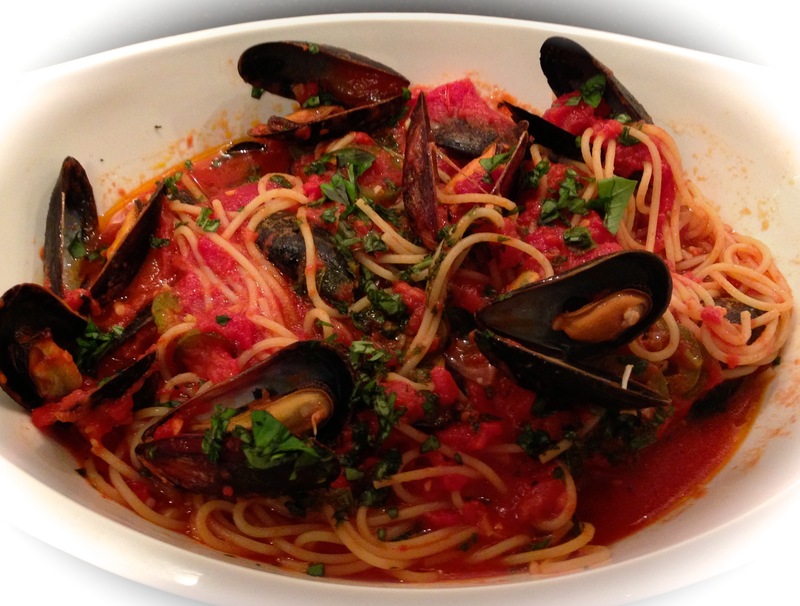 When the mussels are all open, transfer them and all of the liquid to the pan with the marinara, lower the heat and continue cooking until the spaghetti is ready. 6. 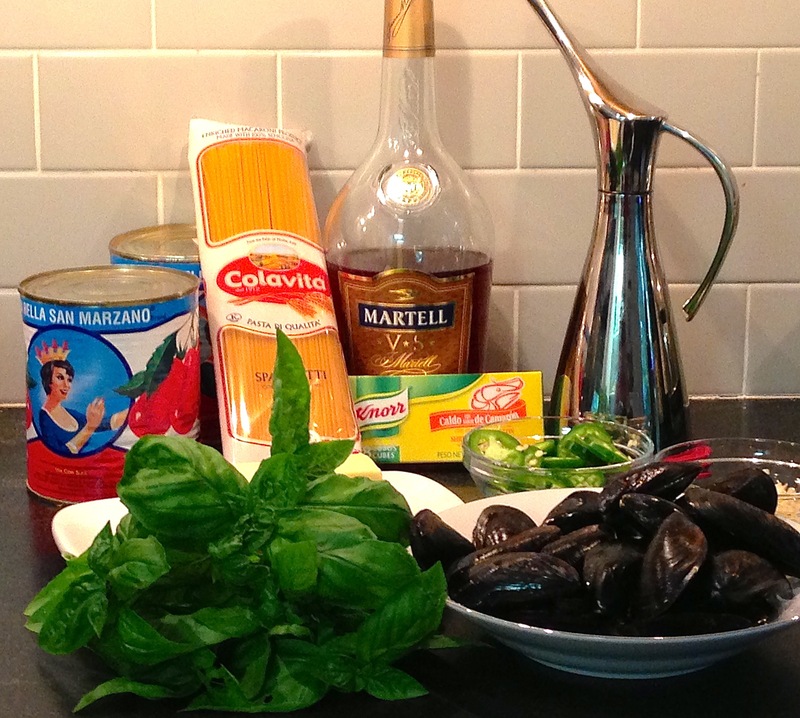 Drain spaghetti, add it to the mussels in marinara, add basil stir mix well serve. 1/2 lb. prosciutto end, trimmed of fat, about 2 cups diced, save some of the fat for rendering. 1. Bring large pot of water to boil for the penne. 2. Render a couple of strips of prosciutto fat and lightly brown the diced prosciutto. Set aside the browned prosciutto and remaining rendered fat. 3. Cook the penne according to directions. When al dente, drain it and add the olive oil and stir, add the mozzarella and mix well. (see Note 1). 4. Add the prosciutto with the rendered fat as well as the roasted peppers and mix well. 5. 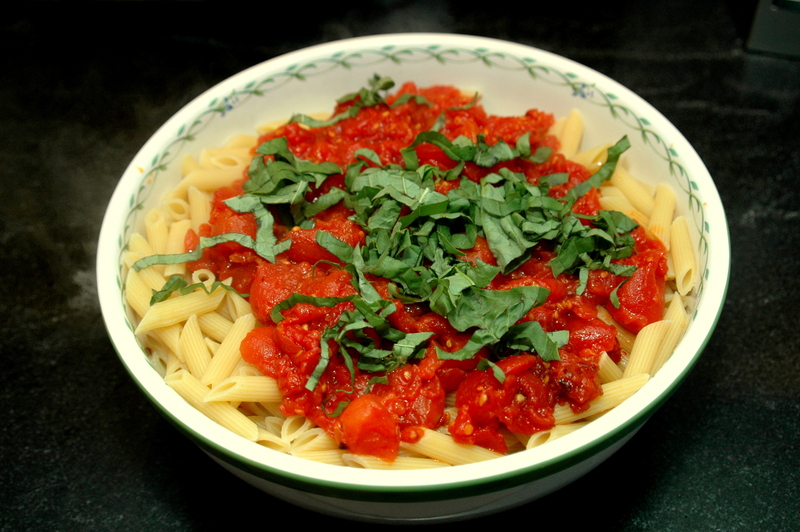 Add tomatoes and basil, mix and serve immediately with grated Parmigiano-Reggiano. Note 1: When it was mixed with the penne, the diced mozzarella did not melt as planned . Instead, it reformed into a mass that had the be pulled apart. Try using ricotta left at room temperature rather than mozzarella. 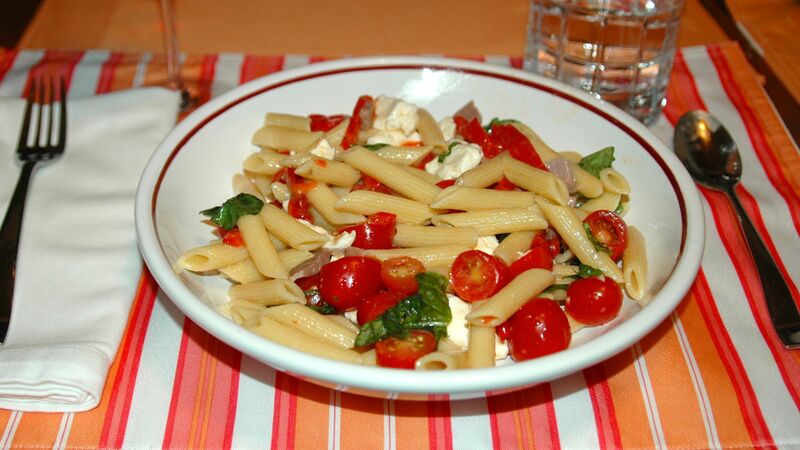 Note 2: Quarter the tomatoes instead of halving them and blanch them before mixing with the penne. If you prepare this meal with the revisions, let us know what you think. 12 ripe plum tomatoes, about 3 lbs. Sea Salt or Kosher Salt, about 2 tsps. 1. Pre-heat oven to 450 degrees and line a baking sheet with parchment paper. 2. Slice off and discard the stem ends of the tomatoes. Cut the tomatoes in half, lengthwise. 3. Arrange the tomato halves on the parchment paper, skin side down and drizzle each lightly with olive oil. Sprinkle Sea Salt or Kosher Salt over each half. 4. Place baking sheet on top rack of the oven and roast for 30 minutes. 5. 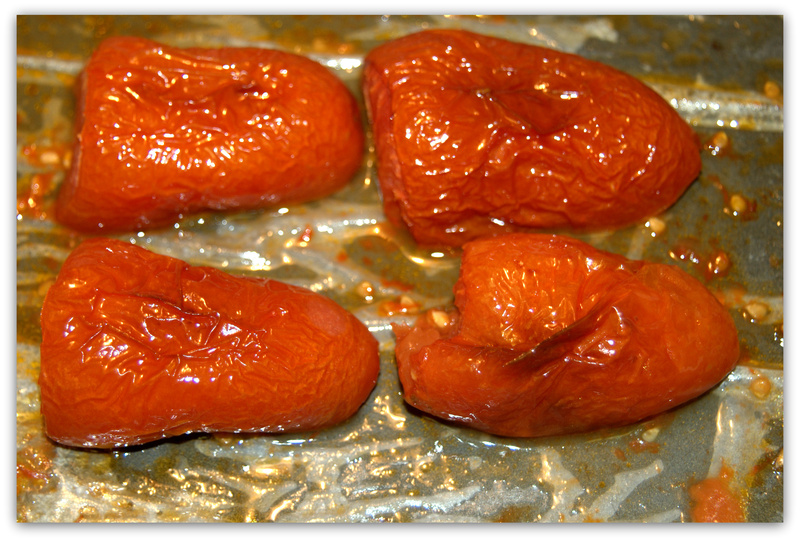 Turn each tomato over and roast, skin side up, for an additional 30 minutes. 6. Remove tomatoes and any liquid to a large bowl, add the garlic, and let cool. 7. Add the basil and oregano, mix well, transfer to a 1 quart jar and cover with about ½ inch of olive oil, stir well. The olive oil will tend to disperse throughout the jar, so make sure there is always about ½ inch on the top. 8. Cover tightly and let marinate at room temperature overnight, then refrigerate. 9. Let marinate in the refrigerator for 2 weeks or more. Stir every few days, taking care to always leave about ½ inch of olive oil on the top, as a protective layer. or serve at room temperature over spaghetti or angel hair pasta. 4 doz. medium-sized Cherrystone or Littleneck clams, about 5 lbs. 1. Set a large pot (6-8 quarts) of water on the stove, cover it and bring to a boil. When it begins to boil, reduce heat, keep covered and hot. 2. Clean and shuck the clams, reserving the juices, you should have about 3 cups. Set aside 12 clams unopened – 3 for each pasta serving. 4. 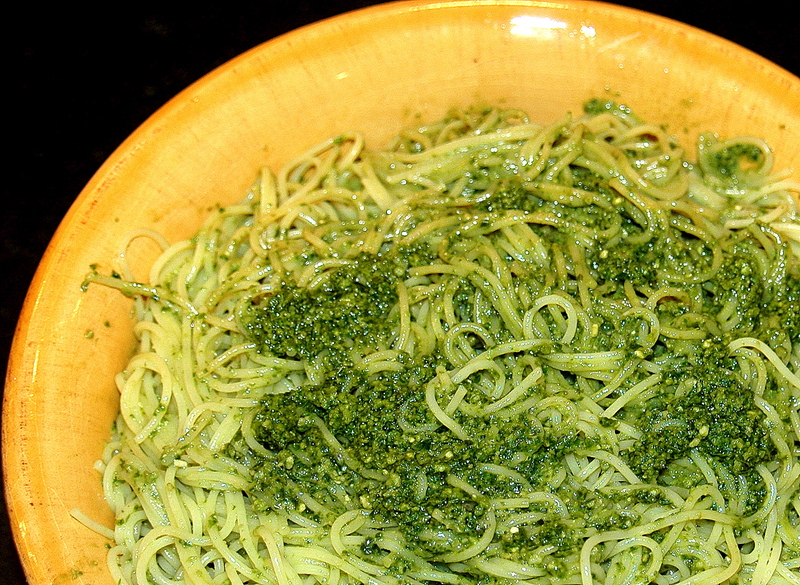 Wash and dry the parsley, but do not chop it until just before adding to the sauce, that retains its color. 5. Heat the olive oil on medium in a large sauté pan, and add the butter. 6. When the butter is melted, foamy and bubbling, reduce heat to medium, add the garlic and cook it stirring continuously for about 1 minute. 8. Add clam juice and reserved clam liquid. We prefer our clam sauce with a lot of liquid, if you prefer it on the dry side, than add only 1 bottle or none. 9. Bring to a boil for 3 minutes. 1. Bring the pasta water and clam sauce to a full boil. Add the 12 reserved unopened clams to the sauce and cover. 2. Add kosher salt to the water and add the linguine. 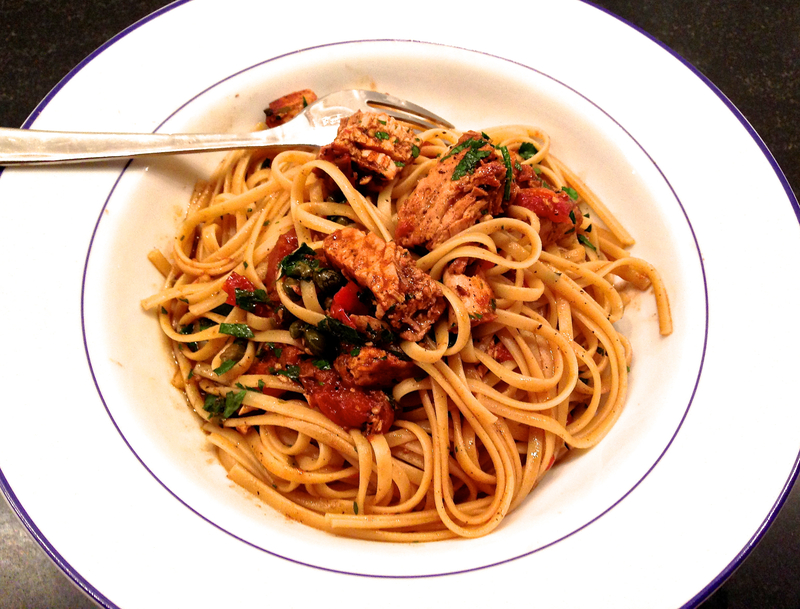 Cook the linguine until not quite al dente, about 7 minutes. 3. After the pasta has been cooking for about 3 minutes, remove the cover from the sauce, add the parsley and shucked, stir well, and continue cooking uncovered. 4. Drain the pasta, add it to the sauce in the pan, and mix it well with tongs until al dente. 5. Remove to a large bowl and serve, garnishing each dish with 3 clams that are still in their shells. Hot crusty Italian Bread makes a great accompaniment, as does a good dry white wine such as Wairau River Sauvignon Blanc. Please see Clam Shucking for the secret on opening clams. 1. Melt the butter in a large sauté pan and add the onion. Sauté on medium-high for about 8 minutes. 2. Raise the heat to high, add the vodka and let sit 15 seconds. Shut the heat and ignite the vodka. CAUTION: Stand back from the stove, and if you have a vent fan directly over the stove be sure to shut it before igniting the vodka. 3. When the flame subsides, return heat to medium high and whisk in the cream. 4. With heat remaining on medium-high, slowly whisk in the cheese, ¼ cup at a time until fully blended. 5. Stir in two dashes of nutmeg. 6. Slowly add the tomato sauce until the color turns a desired shade of pink. 7. When the Penne is cooked al dente (about 11 minutes), drain it and slowly mix in with the vodka sauce, then transfer to a serving dish. 8. Sprinkle liberally with your choice of parsley or basil. 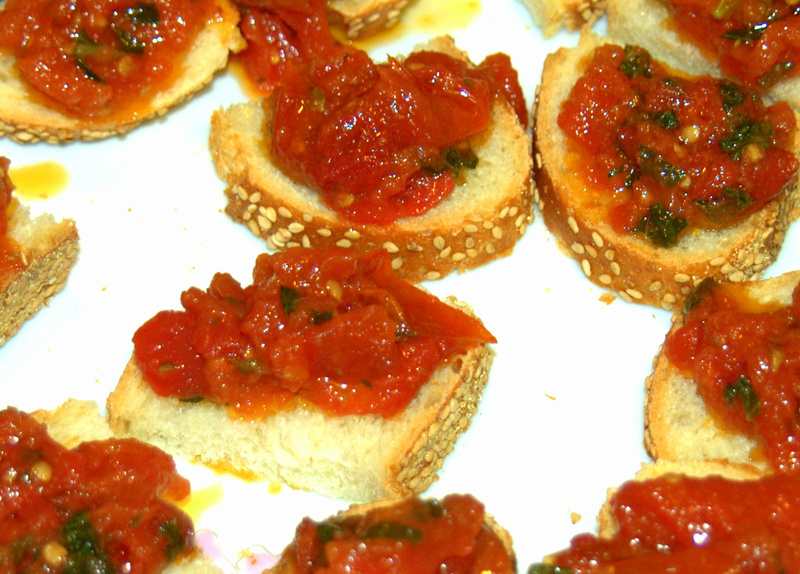 Serve with hot crusty Italian Bread and a fine Sangiovese such as a Chianti Riserva. Note: if making for a larger group, merely double each of the ingredients. Please refer to Tommy T and Me. Our granddaughter, May, defines the term fussy eater. So imagine how thrilled The Literate Chef and I were when she devoured my meatballs during a recent visit. 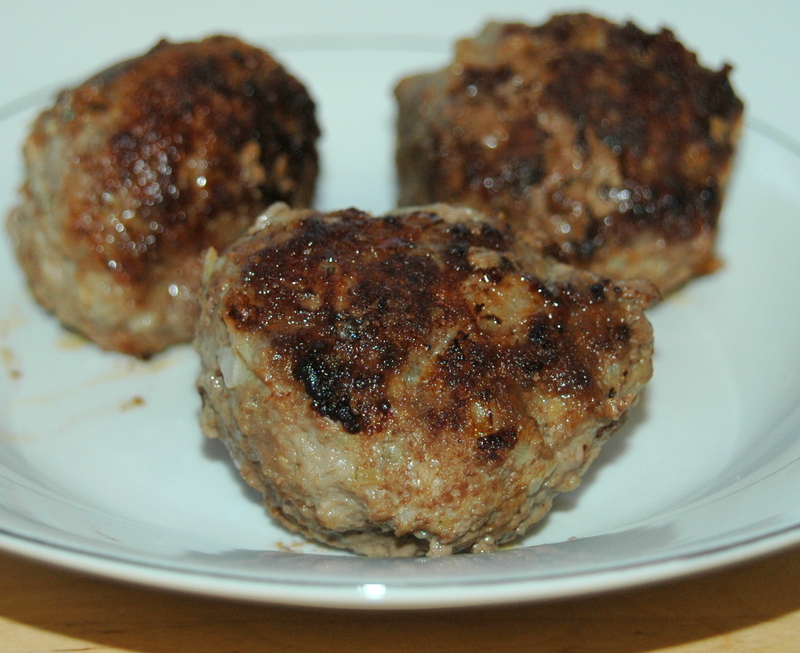 With the love of our granddaughter in mind, I share my recipe for Grammy’s Meatballs. 1. Place all of the above ingredients, except the olive oil, in a large bowl, and kneed them together until well mixed and spongy. 2. 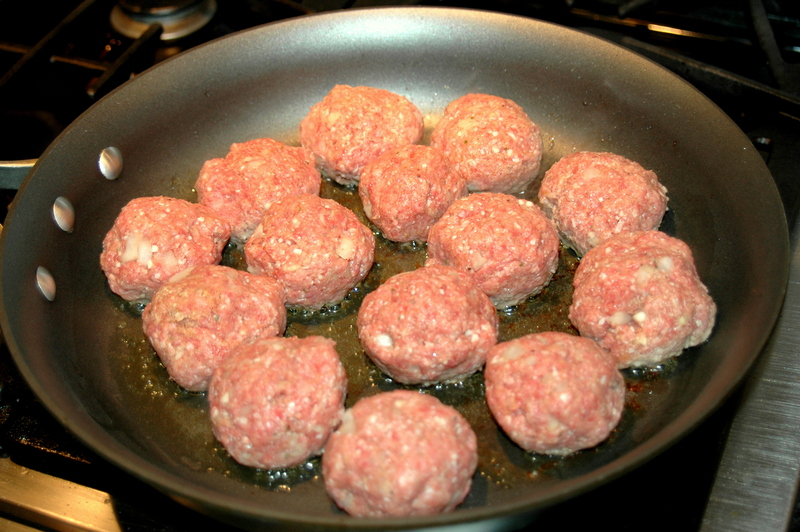 Form into 16 medium size (about 2 inches in diameter) meatballs. 3. Heat the olive oil in a skillet over a medium-high flame. 4. Add the meatballs and brown on all sides for approximately 5 minutes. 5. Reduce flame to medium and continue cooking, turning frequently, for an additional 15-20 minutes. Serve immediately. Please see: The Secret’s Out! Active preparation time – 45 minutes, inactive cooking time – 1 hour. Serves 8 people. 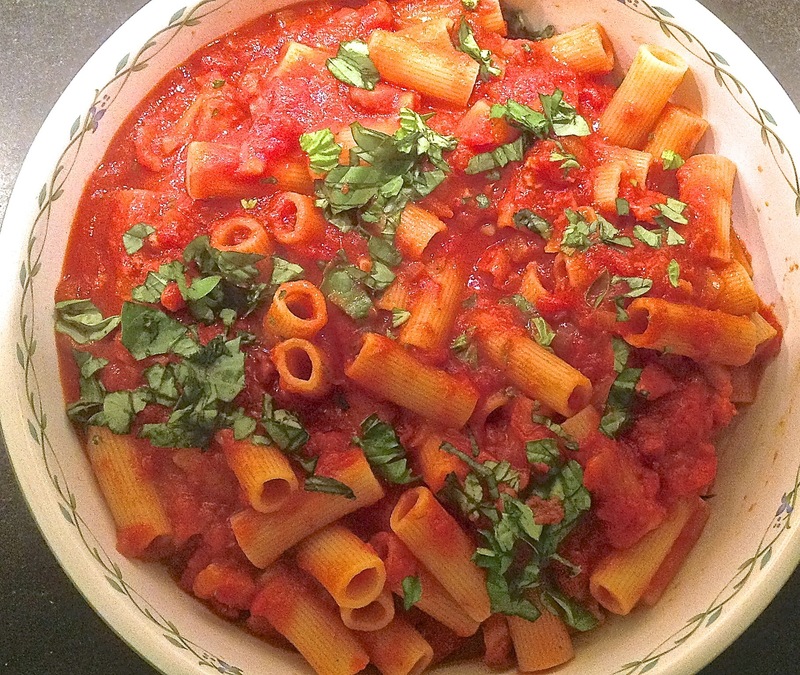 The sauce may be made in advance and reheated before cooking the Rigatoni. 2. 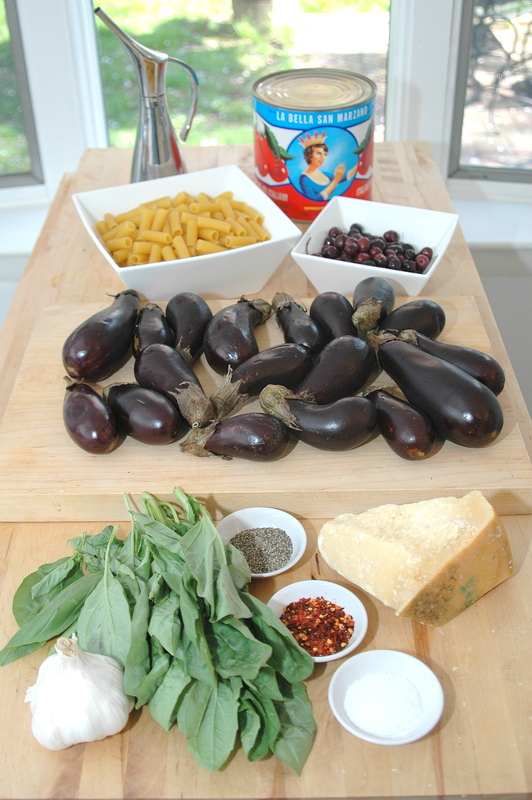 In a large bowl, toss the cubed eggplant with 1 cup of the olive oil. When fully coated, sprinkle with salt & black pepper and toss again. 3. Spread the eggplant in one layer on a cookie sheet, roast in the oven for 40 minutes. 4. While the eggplant is roasting, brown the sausages on medium heat for 20 minutes, turning frequently. 5. When browned, slice the sausage into ½ inch pieces. 6. Heat remaining olive oil on high in a 6 quart pot. 7. When oil is hot but not smoking, reduce heat to medium, stir in the chopped garlic and sauté for 1 to 2 minutes. Add the sliced sausage, stirring constantly for about a minute. 8. Add the tomatoes and their liquid; return heat to high and bring to a boil. Reduce heat to medium, cook uncovered for 15 minutes, stirring frequently. 9. Add the roasted eggplant and wine, turn heat to low and simmer uncovered for an hour to fully blend flavors, stir periodically. 10. Fill a large pot with sufficient water to cook the Rigatoni according to directions on the box of pasta. 11. When Rigatoni is cooked, drain and toss it with the sauce. 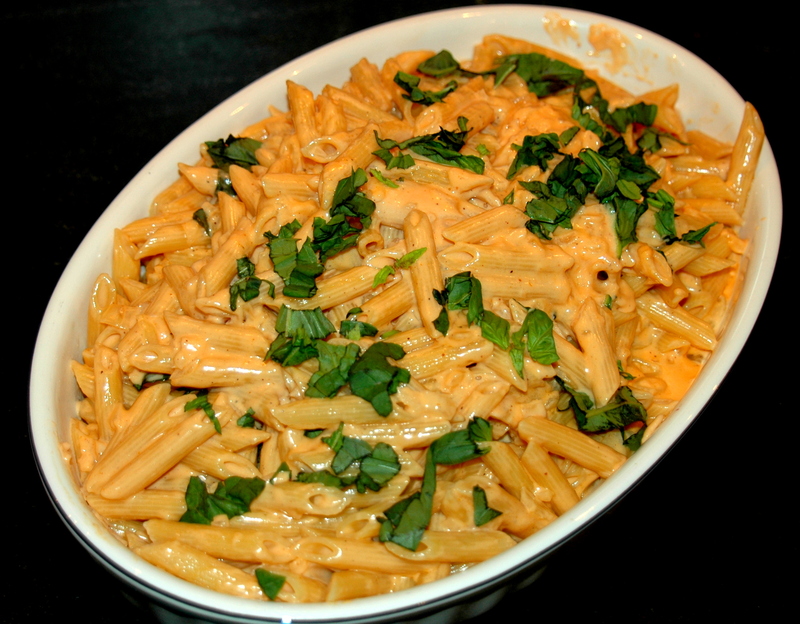 Add the diced mozzarella, one handful at a time,and toss well to melt and spread throughout the pasta. 12. Add the basil and serve at once with grated cheese. Please see: Cooking in Naples…Florida, that is! 1. Place chopped garlic and pine nuts in a food processor. 2. Add the basil leaves and pulse-chop the ingredients, pausing after 10 pulses or so to push down the basil leaves with a spatula. Continue pulsing until all of the basil is chopped. 3. Slowly add the olive oil while running the food processor. 4. Scrape all of the ingredients from the sides with a spatula. 5. Slowly add the grated Parmigiano-Reggiano and give it one or two quick pulses. 6. Transfer the pesto sauce to a clean, pint-sized jar. When the pesto settles, slowly top it off with about ¼ inch of olive oil, which acts as a preservative air barrier and prevents the pesto from being exposed to air, turning brown and going bad. In this state it can be refrigerated for several weeks. • Cook pasta according to directions. • When pasta is cooked and before draining, remove 1 cup of pasta water, add it to a large bowl, drain and add pasta to the bowl and toss, add pesto sauce and mix well. 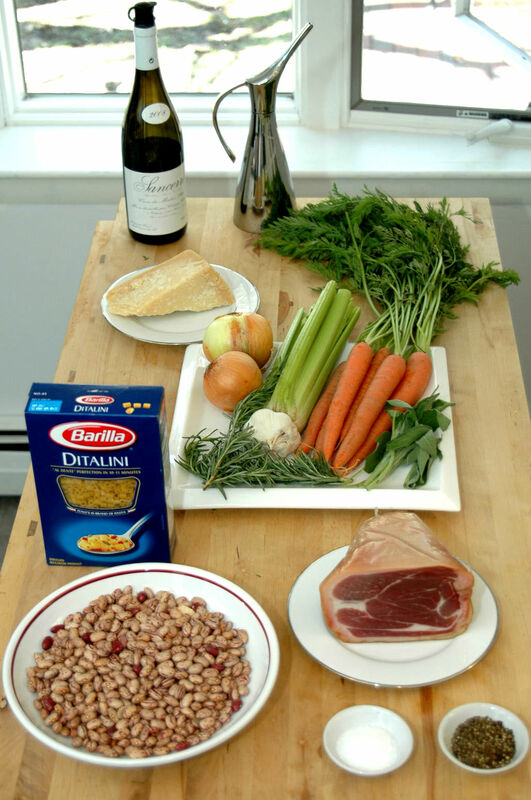 • Serve with freshly grated Parmigiano – Reggiano. Recipes from “Moms on the Go” are starting to come in. Here’s one from our daughter. A “Mom on the Go” with one child and another due to arrive any day now. 1. Cook pasta according to package directions. 2. Meanwhile, warm 1 tablespoon of the butter in a medium saucepan over medium-low heat. When the butter starts to bubble, add onion and cook for 3 to 4 minutes, until translucent, stirring often. 3. Add the peas and water to the pan and cook 3 minutes, stirring. Stir in the ham and cook 2 minutes. Add the cream; bring to a low simmer and cook 5 minutes. 4. Drain pasta; place in large serving bowl. Stir remaining 2 tablespoons butter into the cream mixture over low heat until melted. Stir in the cheese. Pour sauce over pasta and toss to coat. Season with salt and pepper to taste. 4. 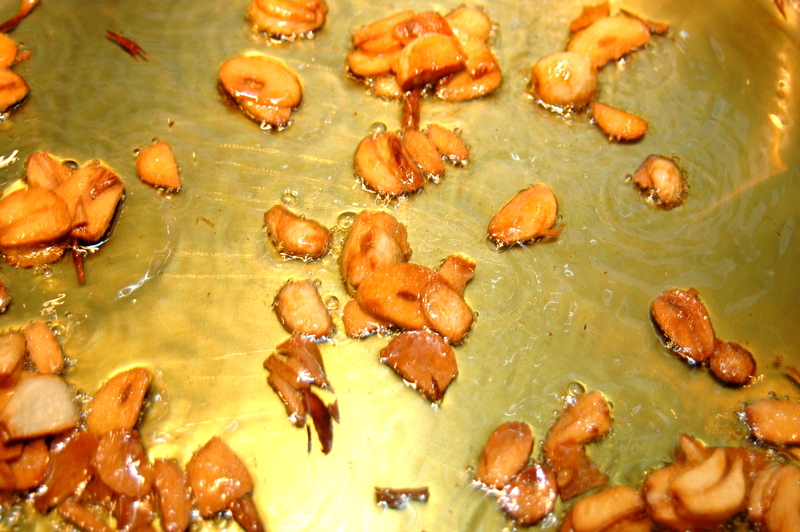 When oil is hot, but not smoking, stir in the sliced garlic and sauté until it begins to turn a dark almond color; quickly remove the sliced garlic with a slotted spoon before it begins to burn and discard it. 4. When garlic turns very light golden color, shut the heat, add 1 teaspoon of hot red pepper flakes, wait about 10 seconds. 5. Add shrimp and turn flame to high. Sauté and periodically turn the shrimp for 3 minutes, add white wine and continue cooking 2 minutes more, until gray color is completely gone and shrimp are pink throughout. 7. When the linguine is cooked, drain it and toss it well with the sauce. 8. 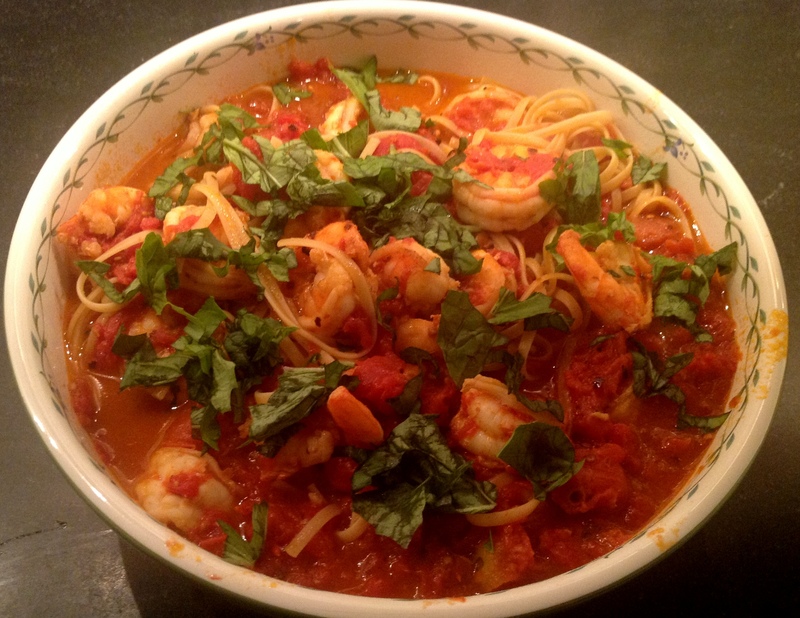 Tear basil leaves into small pieces and add to the Linguine with Shrimp, Fra Diavolo, toss well again and serve. Hot crusty Italian Bread makes a great accompaniment, as does a good Chianti. While some think that it is anathema to serve grated cheese with seafood, I do not subscribe to that philosophy and believe that this dish benefits from some freshly grated Pecorino – Romano cheese sprinkled over the pasta. If you wish to make this dish for more than 4 people, add one more can of tomatoes, one more pound of linguine and additional shrimp as necessary; the quantity of the other ingredients can remain as above. 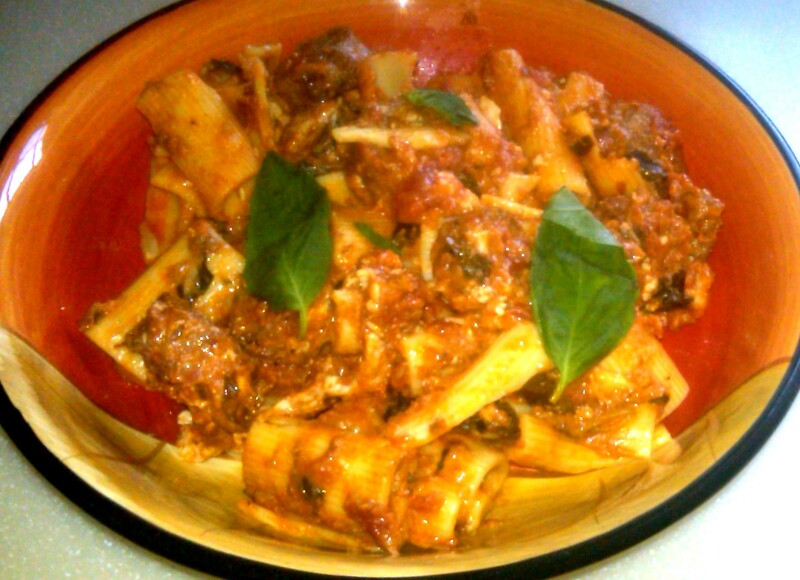 Rigatoni with Roasted Eggplant and Black Olives in a spicy tomato-based sauce. NOTE: This recipe, which makes about 5 quarts of sauce can be frozen in batches and is enough for 3 lbs. of Rigatoni. 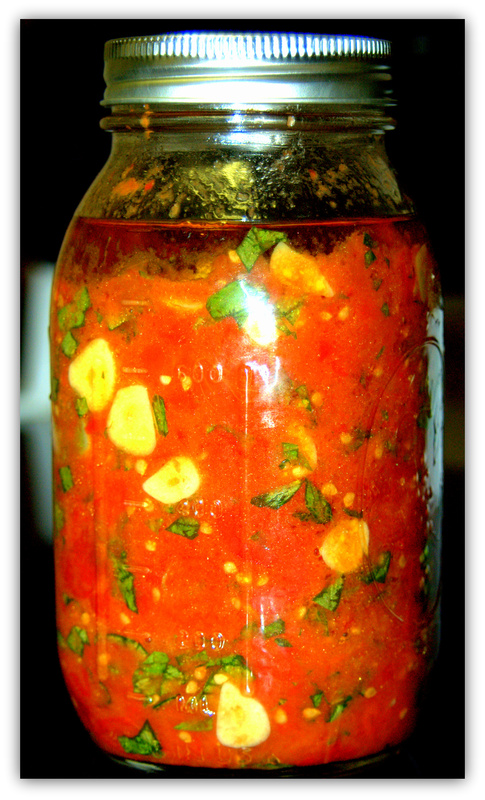 1 tablespoon of Hot Red Pepper Flakes (if you do not like it spicy, use ½ tablespoon or 1 teaspoon). 3. Spread the eggplant in one layer on 1 or 2 cookie sheets, roast in the oven between 30 and 40 minutes. 4. Heat remaining olive oil on high in an 8 quart pot. 5. When oil is hot but not smoking, reduce heat to medium, stir in the chopped garlic and sauté for 1 to 2 minutes. Quickly add the hot red pepper flakes followed by the olives, stirring constantly for about a minute. 6. Add the tomatoes and their liquid; return heat to high and bring to a boil. Reduce heat to medium, cook uncovered for 15 minutes, stirring frequently. 7. Add the roasted eggplant and wine, turn heat to low and simmer covered for about an hour to fully blend flavors, stir periodically. 8. Fill a large pot with sufficient water to cook the Rigatoni according to directions on the box of pasta. 9. When Rigatoni is cooked, drain it and toss it with the sauce. 10. Tear basil leaves into small pieces and add to pasta, toss well again and serve with freshly grated Parmigiano-Reggiano. Hot crusty Italian Bread makes a great accompaniment for this pasta dish, as does a bottle or two or three of full-bodied Sangiovese. 1. For the pasta, bring a large pot of salted water to a boil. 2. In the meantime, heat the olive oil in a deep frying pan. 3. When the oil is hot, add the garlic slices and stir frequently. 4. When the garlic begins to turn medium-brown (3-4 minutes), shut the heat and remove the garlic with a slotted spoon and discard. 5. With the heat still off add the pepper flakes to the hot oil. 6. Quickly add the cut-up drained tomatoes before the pepper flakes burn, turn the heat to high and cook for about 10 minutes. 7. 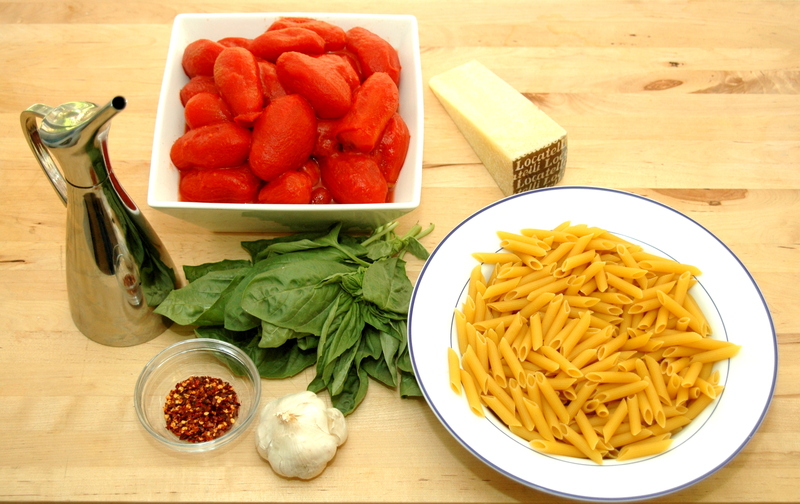 When the pasta water comes to a boil, add the penne and cook according to directions. 8. Drain the pasta well, transfer to a large bowl and add the sauce. Stir well, add the basil and stir again. Serve with grated Locatelli Romano Cheese, warmed Italian Bread, a bottle of Montepulciano d’ Abruzzo Riserva and a salad. Preparation time is 30 minutes. Cooking time, exclusive of soaking the beans, is approximately 3 ½ hours. This recipe produces about 8 quarts of fairly thick soup. If you like it soupier, add more water before serving. I use Borlotti beans, which are also known as Cranberry Beans. However, if they are not available, use white Cannelini beans. The correct ratio of beans to pasta is 3:2. 2 sprigs of rosemary, stems removed and discarded, chopped. 1 prosciutto end, about 1 lb. 1. Soak the beans overnight for 12 hours, then drain and rinse them and set them aside. As an alternative, cover the beans in an 8 quart pot with 4 quarts of cold water and bring to a boil. Boil the beans for 2 minutes and remove from the heat, let stand in the pot, covered, for one hour, then drain, rinse and set aside. Rinse out the pot and use it to prepare the soup. 2. Heat olive oil on medium heat in an 8 quart pot. 3. Add garlic and stir for two minutes until translucent. 4. Add carrots, onions and celery, stir for an additional two minutes. 5. Add beans and mix well. 6. Add 4 quarts of water. 7. Add chopped herbs and mix well. 8. Add prosciutto, bring to boil, reduce heat to medium and cook uncovered for 1 hour. Stir at 15 minute intervals. 9. After 1 hour, cover pot, reduce heat to low and simmer an additional 2 hours. Stir every 30 minutes. 10. Remove beans, vegetables and meat and set aside. 11. Add the wine to the broth. If it is too thick add some water and bring to a boil. 12. Add the Ditalini and cook for only 6 minutes, as it will continue to cook. 13. While the pasta is cooking, chop the meat discarding any bone and gristle. 14. There should be about 8 cups of beans and vegetables. Mash, or puree in food processor, about 1/4 (2 cups) of the beans and vegetables. 15. Return mashed beans, whole beans and chopped prosciutto to the pot. 16. Add pepper and salt, as well as 2 more cups of water and the chopped sage. Mix everything well and continue on low heat to blend flavors until ready to serve or save. 17. Serve in soup bowls with extra virgin olive oil, freshly grated Parmigiano Reggiano and Dorothea’s Homemade Hot Pepper Sauce. 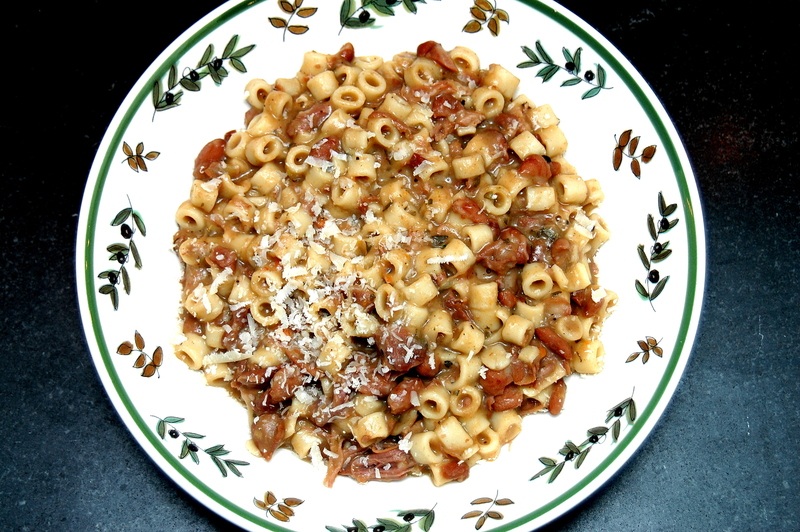 See Related Article at: Pasta Fagioli or Pasta Fazool? This recipe will easily serve 8 people with leftovers. 1. Bring a large (8 quart with a removable strainer) pot of water to boil for blanching the broccoli rabe, as well as for cooking the orecchiette. 2. Remove sausage meat from its casings and discard the casings. 3. Heat 4 tablespoons of olive oil in a heavy frying pan on medium heat. 4. Add sausage meat to the hot oil, continuously breaking up the meat with a wooden spoon until it loses its pink color and is lightly browned-about 20 minutes. 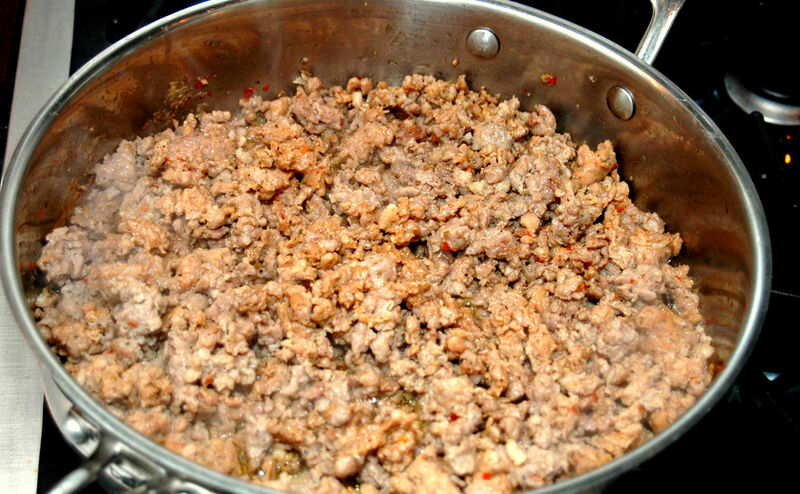 When sausage meat is cooked remove it to a bowl. 5. 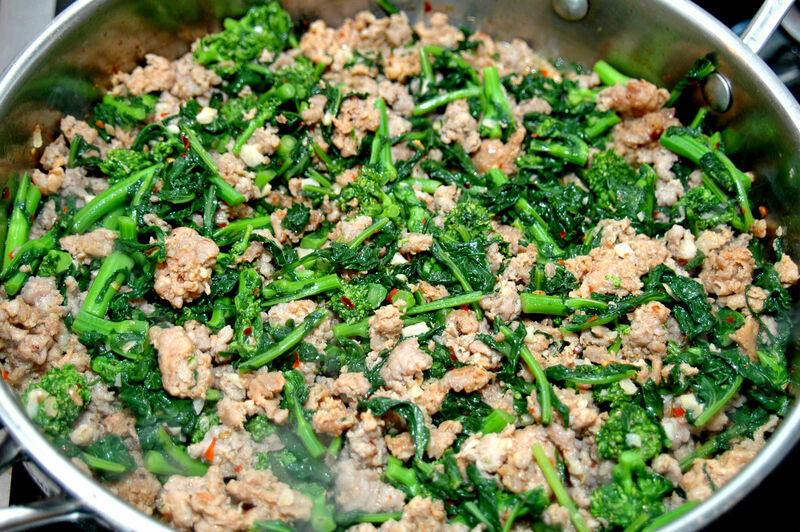 While the sausage is browning, rinse the broccoli rabe and discard the thick stems, cutting about 3 inches off the bottom. 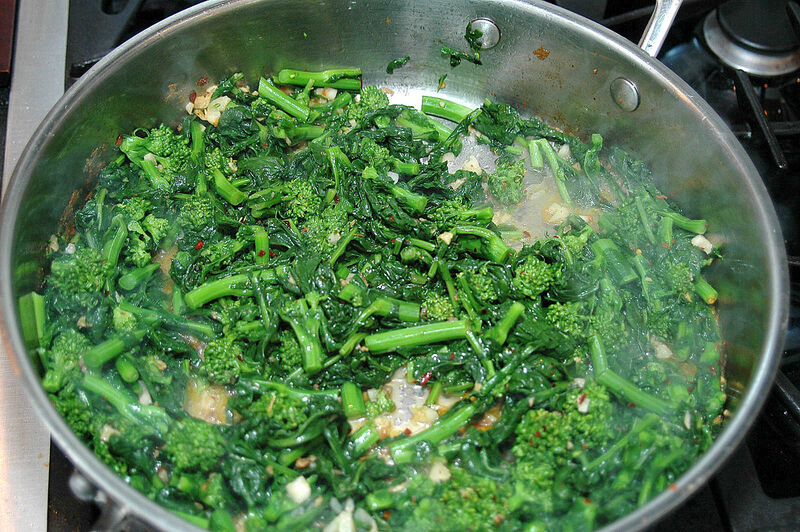 Then blanch the broccoli rabe in the boiling water for about 60 seconds. 6. Remove the broccoli rabe, strain it and plunge it immediately into a bowl filled with ice and cold water to retain its dark green color. Reserve the blanching water for cooking the orecchiette, but remove about 4 cups to thin out the sauce later, if needed. 7. When broccoli rabe is cool, chop it into pieces about 1 to1.25 inches in length. 8. After removing the cooked sausage meat from the frying pan, add the ½ cup of olive oil to the pan, then add the chopped garlic and quickly sauté it on high heat. As the garlic begins to brown on the edges, add the hot pepper, then the broccoli rabe and sauté it for about 3 to 5 minutes so it does not lose it dark green color. Remove it from the pan and set it aside with the sausage meat. 9. Bring the blanching water to a boil once again, add the orecchiette and cook according to the directions on the package. 10. In the meantime, turn the heat under the empty frying pan to high, add the ½ cup of dry white wine stirring up the solids on the bottom of the pan. 12. When the orecchiette is al dente, drain it and mix it well with the sauce, adding more blanching water if necessary. 13. 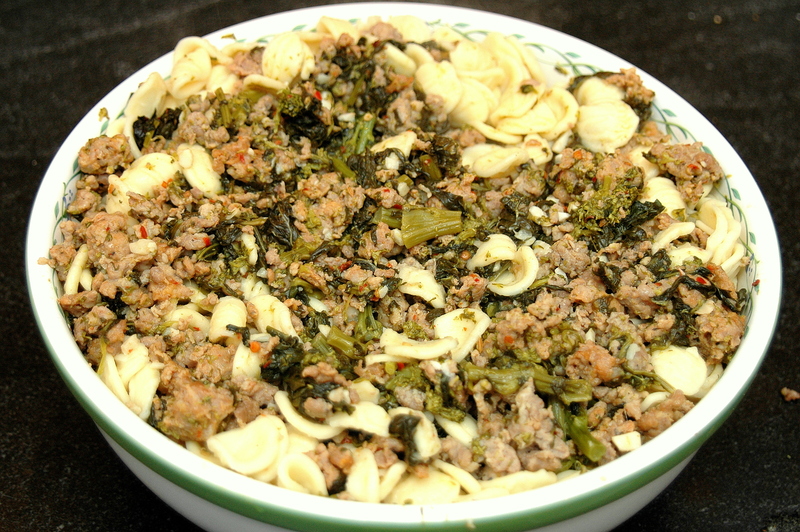 Serve orecchiette, broccoli rabe and sausage in pasta bowls and sprinkle liberally with freshly ground black pepper and the grated cheese. 2. Add the leftover linguine and cauliflower, frying the pasta and cauliflower. 3. Sprinkle the cheese on the pasta and cauliflower and stir and turn until fully blended. 4. Keep frying and stirring until the pasta noodles become crispy. 5. When done to your taste remove from the heat and enjoy.